At KBC our kids (infant through 9th grade) experience safe, age-appropriate environments where they learn about Jesus in a creative and relevant way. We love to help kids grow in relationship with Jesus and each other! KBC volunteers provide a rich and dynamic programs for their kids. All our staff and volunteers have completed the Child Safe Environment training and have current Police Clearances. KBC Kids Ministry is called Activ8 - it's the overall name for all the kids programs run by KBC. We would love to see you and your family visit KBC and check out our Active8 programs. To find out about other Activ8 programs, look below. To find our location on Google maps, just click the button below. We encourage all parents and kids to participate in the first part of our worship service (usually the first 20 min of the service // 10am-10:20am). KBC Active8 program usually ends around 11am (right before or few minutes after the conclusion of our worship service). DigIn is an overarching program run on Sunday mornings. In this program, kids aged 0-14, will learn about the life of Jesus from birth to resurrection and ascension. More info about each group below. KBC offers creche/childcare during service for infants (age 0-5) led by our parent volunteers. 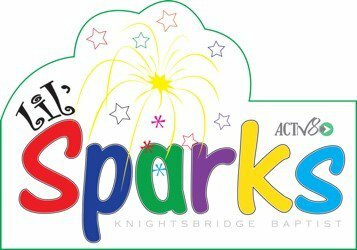 Sparks is a group where kids get to learn about famous Biblical characters and their stories. This group is suitable for kids up to 8 years old. This group is for kids 12-14 years old (school years 6-9) and focuses on connecting with God and others in the group. There is a Bible study and a prayer focus. If you have further questions concerning our KBC Kids experience or visiting KBC with children, simply click the button below and get in touch with us!